Aegean Odyssey had been in the port of Falmouth overnight. By the time I joined the ship her guests were already up and out on various included tours, leaving the ship empty and free for me to explore. I left my luggage in my cabin – a small solo outside on deck 7 – and off I went to see what treats she had to offer. It was the possibly the shortest ship tour in history. After just 20 minutes I’d seen almost everything and was sitting comfortably in the Charleston Lounge with a drink and a book that I had borrowed from the onboard library. This cruise experience certainly felt different, but then Voyages to Antiquity (VTA) operates a cruise experience quite unlike any other. Its focus is bringing alive the history and culture of the destinations it visits and VTA does that both through included tours in almost every port and through offering talks from a variety of expert guest lecturers on every voyage. It’s a real in-depth cruise experience and one that is clearly loved by many. During my time on board, I met passengers from all over the world – and nearly all of them were repeat cruisers with VTA, which must tell you something about the quality of the product that is on offer. Although the line only operates one vessel, she is charming, clearly favoured by her guests (many of whom were travelling solo) and well taken care of by her crew. As you may have guessed, I found the onboard experience to be very relaxing. Aegean Odyssey’s crew were superb – like one large family – and they certainly made sure that every guest was content and their needs met. There were no stuffy dress codes to adhere to, no pushing of photograph sales (because there is no onboard photographer) and no additional charges for facilities on board other than (as you would expect) the spa and salon. The organisation of the tours was impressive – and ticketless. Everything was arranged via a colour system. I’d never experienced this before, but it worked perfectly. You chose your included tours before joining the ship and then checked the daily journal for your meeting time based on the colour you were allocated. Simple! 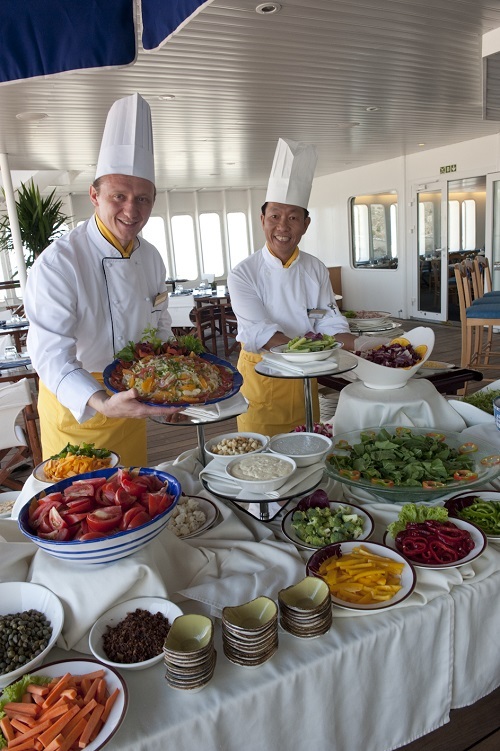 The food options were varied and you had a choice of two dining venues: the Marco Polo Restaurant or the Terrace Café, the latter of which offered inside and outside dining. I favoured the Terrace Café and especially looked forward to the special lunch offerings. On our final day aboard, this was Indian food. It was superb, possibly the best Indian food I’ve had at sea. Pizza and pasta are available at lunch and dinner every day, so if there’s nothing on the main menu that takes your fancy, you can still enjoy some fresh Italian food. Menu options during my time on board included spinach and mushroom cake, roasted veal loin, turkey scaloppini, chicken piccata, duck breast, John Dory fillet, beef tournedos, beer battered fish, egg stuffed meatloaf, vegetable strudel and whole roast pork leg. Overall, I was impressed with the entire VTA experience and genuinely sad to leave the ship in Tilbury. Four days simply wasn’t long enough. Hopefully, my next journey will allow me to sail with her for at least a week. 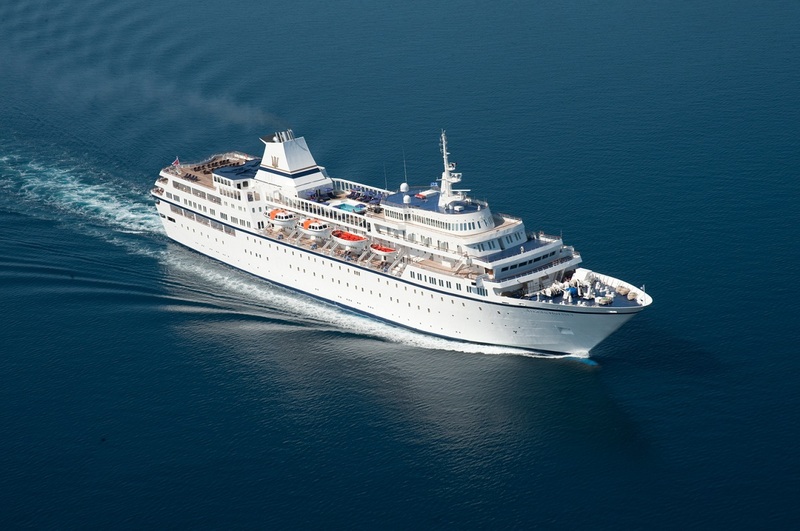 If you’re looking for a cruise experience that also offers an educated look at some of the world’s most impressive destinations, then Voyages to Antiquity is the choice for you. The 2018 season is on sale now and features some stunning itineraries in Cuba, the Caribbean, Mexico, the Mediterranean, Northern Europe, the Aegean and the Adriatic. You can visit www.voyagestoantiquity.com for more information.